Aaron Summers rides for Panthers in Wolverhampton. 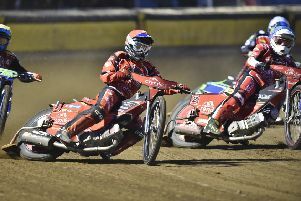 Team boss Carl Johnson has called on Peterborough Panthers to kick-start their 2019 campaign during a hectic week of racing. The city team travel to Wolverhampton tonight (April 8, 7.30pm) for an SGB Premiership Supporters’ Cup tie. Bradley Wilson-Dean rides for Panthers in Wolverhampton. It marks the start of a busy spell with a re-arranged trip to Belle Vue following on Wednesday (April 10) ahead of a home showdown with Wolverhampton on Thursday (April 11). And, after launching a new era of top-flight action in a losing manner last Monday (April 1) when beaten by Belle Vue at Alwalton, Johnson is keen to see his men pick up positive results. He said: “We got the first meeting under our belts and the season is really going to gather pace in the next few days. “It was disappointing to be beaten by Belle Vue last week, but there were plenty of good signs and I’m confident we’re not far away from getting results. “Hopefully that can happen this week as we want to put that first win on the board as soon as possible. “Wolverhampton is a tight, technical track which will suit a lot of our boys. I feel we have a team which will be effective on the road and tonight is the first opportunity for us to show that after the postponement at Belle Vue last Thursday. Wolverhampton lost key man Jacob Thorssell to injury on the eve of the campaign with Panthers’ number one of 2018, Scott Nicholls, drafted in as a replacement. And they are without Australian racer Nick Morris tonight after he suffered a wrist injury in a recent crash in Poland. Panthers are at full strength but continue to search for a new signing following the eve-of-the-season exit of former GP rider Craig Cook. Short-term signing Aaron Summers continues in the team tonight and that’s also likely to be the case on Wednesday and Thursday. Johnson added: “We’ve spoken to riders about coming in and we’re hopeful of making something happen sooner rather than later. WOLVERHAMPTON: Sam Masters, Kyle Howarth, Scott Nicholls, Rider replacement for Nick Morris, Rory Schlein, Ashley Morris, Luke Becker.